In order to gain the affection of his cherished MINTO, PAPRI first must collect 10 flowers from her garden in order to create a beautiful flower bouquet that will help her declare her own feelings towards him. ▲Don't let MINTO reach the arms of COCCO-chan! If the bears spot PAPRI around they will turn blue and start to chase her. Bears aren't fast runners though, so it will be easy for PAPRI to leave them behind (at least for the first 10 rounds anyway). After Round 10 however, they will become faster and more numerous, and from that point on the game will start getting more and more difficult. Fortunately PAPRI came well prepared to deal with these annoying hibernating creatures and brought along a bunch of honey pots that she can use to keep them occupied for a while. Honey will be your only weapon against the bears so it's better to save as much as possible for the later rounds where it will become indispensable for your survival. Honey pots can't be placed on bridges. You will also spot a harmless bee flying back and forth throughout the area. The bee will often drop various items that can help PAPRI in her task, so be on the look out for them. From time to time the bee will stop for just a couple of seconds to pollinate a flower. If you can manage to catch it at this precise moment you will be rewarded with some valuable extra honey! These are the items that can be dropped by the friendly bee. Items don't remain on screen for too long so make sure to pick them up quickly. ・Flower Bouquet : Adds 5 Flowers to your current flower bouquet. ・Clock : Extra Time (brings MINTO closer to PAPRI). ・Heart : Adds an extra heart to your love meter. ・Skull : Removes one heart from your love meter (avoid picking it up!). Collecting a regular flower is worth 10PTS while collecting a full bloom flower is worth 100PTS. To make a premium flower bouquet you can only use flowers that have fully bloomed. You must also avoid picking up any whithered flowers along the way since they can spoil your flower bouquet forcing you to throw away some of your hard-earned flowers. After every two rounds you will get to play a bonus「CHALLENGING STAGE」where PAPRI can jump over bears for bonus points. Jumping over 20 bears will further reward you with additional bonus points for successfully clearing the bonus round. 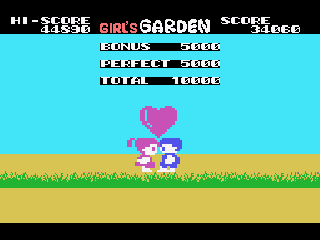 GIRL'S GARDEN only has one type of field screen, however the layout pattern will be changing from round to round thus preventing the game from becoming monotonous. It is also worth mentioning that alongside other remarkable SEGA releases from 1984 like「FLICKY」and「SANRIN SAN CHAN」. 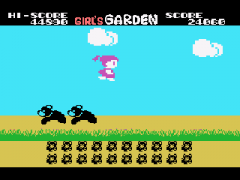 GIRL'S GARDEN is all about getting the highest score and reaching the farthest round possible. Players who are used to retro games probably won't have a problem with this, but others (mainly modern players) may not enjoy this basic gameplay premise as much. GIRL'S GARDEN was the first game that the now legendary game programmer and former SONIC TEAM studio director「YUJI NAKA」(中 裕司) developed for SEGA as a junior game programmer. But more importantly, GIRL'S GARDEN earned NAKA-san the positive critical acclaim and fan appreciation that undoubtedly helped him to start his well-documented and successful programming career. You can read an interview with YUJI NAKA over at the official SEGA Hardware Archives website concerning his involvement in GIRL'S GARDEN. In the interview NAKA-san provides some very interesting facts about the game like how he doubts it was actually released in 1984 as its been officially labeled. He states that he only started working for SEGA in April of that year and the developing and manufacturing times just don't match for a 1984 release. The interview is in Japanese, but you can use an online translation service like Yahoo! Babel Fish or Google to translate the page from Japanese to your language of choice. Great read and nice pick! That Sega Fan Fact was neat too. That's because those icons only appeared on the Japanese MD games, although many third party games never used them. In this case that one is the ACTION game icon. LOL that's a funny way to express action. There are some icons like that on the box of Yu Yu Hakusho Gaiden and Shura no Mon boxes, never knew what they meant except for the 1-player icon, that one was kind of obvious. :) Very cool how you know what they mean. I just read a news article about this game being the first game EVER to have a female playable character. An editor from the dutch FOK!-forum contacted the people from the Guinness book of world records and pointed out that this game is actually the first game to have a playable female character. @ this URL you can read a twitter chat between an editor of the GWR and the editor of FOK!-games (he was doing a thesis on this matter and found out that the GWR had published incorrect data). He actually contacted the people of the GWR and got them to change the entry in the book. Apparently Ms. Pac man is not considered a playable HUMAN charakter and Samus Aran (Metroid - 1986) is considered an NPC. So the prize now goes to Papri from Girls Garden. There were various other female main characters before METROID came out anyway. The Princess from「PRINCESS NINJA」(1985)and the gal from「ONNA SANSHIROU」(1985)are some examples. Awesome presentation. I like your most valuable gaming blog. Best of luck.